While staying at the Elkhart County Fairgrounds in Goshen, IN, for the Escapees RV rally, we had one morning that didn't have any seminars that we were particularly interested in. That was Wednesday, and it so happens the Shipshewana Flea Market is open on Tuesdays and Wednesdays. Therefore, we decided to drive about 30 minutes northeast to the town of Shipshewana to check out the flea market. We visited this area a couple of times before, but this is the first time since we became full-timers. When we were here in the past it was always for a long weekend while we were working, and we were never here when the flea market was open. We were excited to finally be able to see the flea market. We started out in the back row of the market, which had plants, produce and baked goods. There was a baker who had bread, pizza crusts and focaccia. Focaccia is a flat, Italian bread usually topped with herbs and sometimes with other things like vegetables, cheese and meat. The baker had samples of several types of focaccia, and we couldn't resist buying a small piece of Mediterranean-style with herbs, egg plant and feta cheese. Margery had trouble smiling for the photo with her mouth full. Not only did we finally get to see the Shipshewana Flea Market, but Wednesday is also the day they hold antique auctions in the large building adjacent to the outside market. When we first went in, it looked and sounded like total chaos. There was stuff stacked everywhere, there were people milling around, and there were 15 to 20 auctions going on at the same time. All over the building there were auctioneers standing on stools or ladders chanting, and people were shouting out bids. As we walked around, we started to see how things were set up and that there was actually a good bit of organization behind the confusion. Apparently, those wanting to sell merchandise arrive early, unload their trucks or trailers, and make a stack. Auctioneers and potential bidders work their way down the aisles stopping at each stack until all the merchandise has been auctioned off. Potential bidders can also walk among the stacks to examine merchandise ahead of time. We came across some interesting things like a metal soap-box-style racer. There was so much stuff and so many people it was hard to get back far enough to get a good shot of the racer, but the next photo shows Paul standing beside it. One of the lots of merchandise included several old fire helmets that were manufactured back in the 60s and 70s by Paul's former employer MSA. In the photo below, Paul is holding a phenolic (red) and a thermoplastic (black) Topgard® fire helmet. We didn't bid on anything at the auction, but we ended up buying a couple of small items at the outdoor market. Paul bought some bungee cords to replace some we have that are all stretched out, and Margery got some masking tape for a craft project she learned how to do at the Escapade. We also made another pass down the aisle of baked goods and picked up some pumpkin whoopie pies. The flea market in Shipshewana is pretty big, and we ended up skipping about a third of it because we wanted to get back to the Escapade in time for an afternoon session, and because we also wanted to stop for a late lunch on the way back. In addition to being the RV capital of the world, this area is also Amish country, especially around Shipshewana. Our route back to Goshen took us along some back roads where we saw plenty of buggies like the one in the next photo. We could see the buggy had a trailer; and as we caught up to it, we could see what was in the trailer. This little piggy went to market. We passed a one-room, Amish school where the kids were outside playing softball during recess. Check out all the bikes - no school buses here. We always enjoy seeing the well-kept farms. Many of them had laundry hanging out, and the farm in the next photo had a clothes line running from a tree behind the farm house to the peak of the barn roof. Nothing like having your gutchies (Pittsburghese for unmentionables) festooned like signal flags on a sailing ship. We eventually made our way back to Goshen and the South Side Soda Shop and Diner, which was featured on Triple D (Diners, Drive-ins and Dives) back in 2007. It was originally a 1900s grocery store that added a soda fountain in the 1940s. It was restored in 1986 to a 1950s-style diner. We both had a Philly cheese steak sandwich that was excellent. ...but in the end, Paul resisted dessert, and Margery had a chocolate soda. Chocolate sodas are really hard to find, and they are Margery's favorite. This one was a little expensive (we can't see why a scoop of ice cream, a shot of chocolate syrup and a squirt of seltzer water costs almost $4), but it was one of the best she has ever had. We made it back to the fairgrounds in time for the afternoon session we wanted to attend. The next day, there were a few more seminars in the morning followed by the closing ceremonies and a farewell picnic in the afternoon, and a dance complete with disc jockey in the evening. We skipped the dance and chilled out at the motor home instead. The next morning, most of the rally attendees began pulling out. We got a fairly early start and headed east to Berlin, OH. One of the reasons we arrived two days early for the Escapees Escapade in Goshen was to have more time to get settled and to try to squeeze in a little sightseeing before the event started. While we were playing Wii with Marilyn and Alan the evening we arrived, we made plans to visit the RV Hall of Fame about 20 minutes to the north in Elkhart the following day. Elkhart is the RV capital of the world. Fifty percent of all RVs manufactured in the world come from Elkhart and the surrounding area, so it is certainly an appropriate location for the RV hall of Fame. On the way to Elkhart, we made a slight detour to Middlebury to stop at Das Dutchman Essenhaus for the breakfast buffet. Das Dutchman Essenhaus is a sister restaurant to Der Dutchman in Waynesville, OH, where we recently ate with Lora and J. Michael. All 6 of the restaurants in the chain have similar menus, but they have some differences, too. For example, we have eaten at 4 of the 6 restaurants, and Das Dutchman Essnehaus is the only one that has ham on the breakfast buffet. Paul loves ham, and he had three slices. From the restaurant, we continued on to the RV Hall of Fame. The RV Hall of Fame honors influential people from the RV world, including the founders of many RV manufacturing companies and RV organizations. Bob Tiffin, founder of Tiffin Motorhomes, was inducted in 1999. Joe and Kay Peterson, founders of Escapees, were inducted in 2001. In addition to honoring people from the RV industry, the RV Hall of Fame has a museum with 50 or 60 antique and classic RVs on display. Their oldest RV in the museum is a 1913 Earl travel trailer. This is the oldest known travel trailer in the world. The trailer, which was restored in 1980, was custom built for a Cal Tech professor by a carriage maker. Inside, there is quite a bit of storage space in the cabinets and under the dinette seats. The dining table converts to a double bed. The RV Hall of Fame is preparing to celebrate the 100th anniversary of the RV industry. Although there were earlier home-built and one-of-a-kind RVs, the first factory-built RVs started to appear in 1911. Many of the first RVs were tent trailers. They were simply a tent mounted on top of a trailer that had leaves that folded out to form a base for the tent. The photo below is a 1922 Zagelmeyer tent trailer. In this model, the top of the trailer raises up to form a hard roof for the center section of the tent much like modern tent trailers. Being owners of a motor home, we found the early motor homes to be very interesting. The one in the next photo is a custom housecar built on a 1932 Model AA Ford chassis. When it was first discovered sitting in a barn in 1999, the engine was still in good running condition even though it had been stored for 40 years. Restoration was completed in 2003. Although some of the early RVs had relatively nice accommodations, we saw very few with bathroom facilities. The next photo shows one of the few older RVs that had facilities. The large, white box to the right is a bathtub, and that's a chamber pot to the left. >In the next photo, Paul is checking out a 1964 Clark Cortez motor home. The Clark Cortez, which was produced from 1961 to 1974, was the first American production front-wheel drive motor home. Speaking of front-wheel drive motor homes, the GMC is a real classic. Built by GMC from 1973 through 1978, it is the only complete motor home ever built by a major car/truck manufacturer. The 26-foot motor home was designed with a sleek, low profile, fiberglass body. It utilized the front-wheel drive transaxle from the Oldsmobile Toranado and the Cadillac Eldorado, and it had a V-8 engine. Almost 13,000 of the GMC motor homes were produced, and it is estimated 8-9,000 are still in running condition. Another interesting motor home was the Star Streak II. This is the second of two motor homes custom built by Paul Jones. It is on a Cadillac Eldorado chassis and was specifically designed to fit through a residential garage door. The museum also has a housecar built on a 1931 Chevrolet chassis by Paramount Studios as an inducement to get Mae West to leave the vaudeville circuit and to go and make movies for them. It was not a camper, but a chauffeur-driven lounge car with a small hot plate stove and an ice box. It was used to transport Mae West from her home or hotel to the studio. It has a back porch where she reportedly had a rocking chair to enjoy the breezes during breaks in filming. <>RVs sure have come a long way. They are much more comfortable, more reliable and larger than they used to be. We enjoyed seeing all the old RVs, but we were happy to go back to the conveniences of our Allegro Bay. We were able to squeeze in a little more sightseeing while at the Escapade, so stay tuned. We left Branson knowing that we would return. We belong to Escapees, an organization whose mission is to provide a total support network for RVers. About Escapees We stayed at their campground in Branson...full-service hook-ups for just $15/night and 7th night free. They are on the fringes of Branson, so we're close to all the action but it's relatively quiet. We headed east to meet Lora and J. Michael for Labor Day at our favorite Ohio State Park, Caesar Creek between Dayton and Cincinnati. We needed two places to stop on the way east. One of the joys of full-timing is being on your own schedule. We try to get settled in a spot by mid-week so that we don't compete with the weekend warriors. Meramec State Park in Missouri was beautiful when we pulled in...sun-dappled sites and nearly empty. This is a popular park for tubing and canoing down the Meramec River. There are caverns nearby, too. Meramec State Park However, rain can be a problem as the campground is located on a flood plain. In fact, the campground is inaccessible when the river floods. Because it's been so dry, that wasn't a problem during our visit, but there is not good drainage when it rains. The water even pooled on our cement pad. 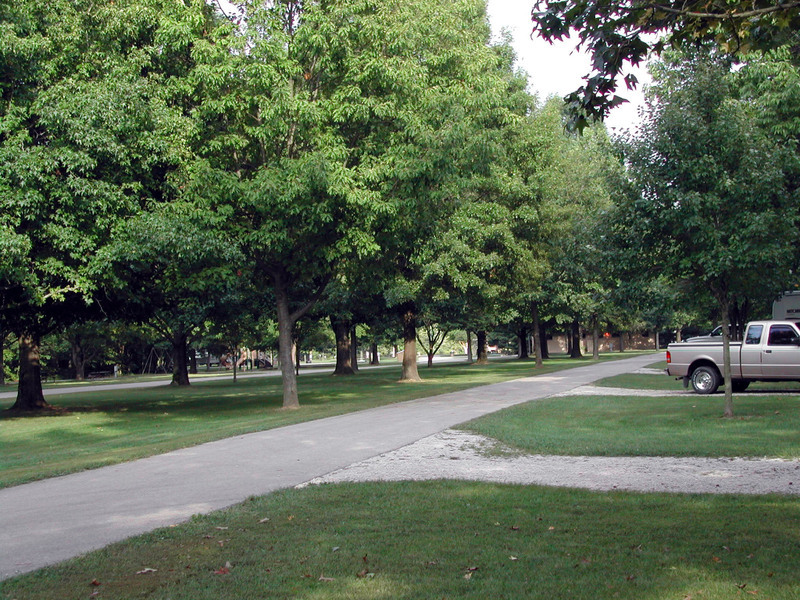 For our second stop, we chose a city park in Paris, IL, rather than Lincoln Trail State Park also in Illinois. However, the on-line description of Lincoln Trail said that it had a heavily wooded shoreline along the lake. So, I ASSUMED that the campground would be heavily wooded as well. Since Paul says his underwear gets moldy if there are too many trees and not enough sun, we thought the city park would be a better choice. Well, you just can't make assumptions. After traveling 10 miles off the interstate to Paris, we found the city park lovely, but the camp sites on a slope that made it impossible to level the motor home...so we headed back 10 miles to the interstate and then another 5 miles south to Lincoln Trail. WOW...this is what we found. It's a beautifully maintained park with great places to bike ride and hike. There's plenty of sunshine but shade too with a tree on each campsite. Lincoln Trail State Park Open year round, we'll definitely find our way back here. We had a great visit with Lora and J. Michael. 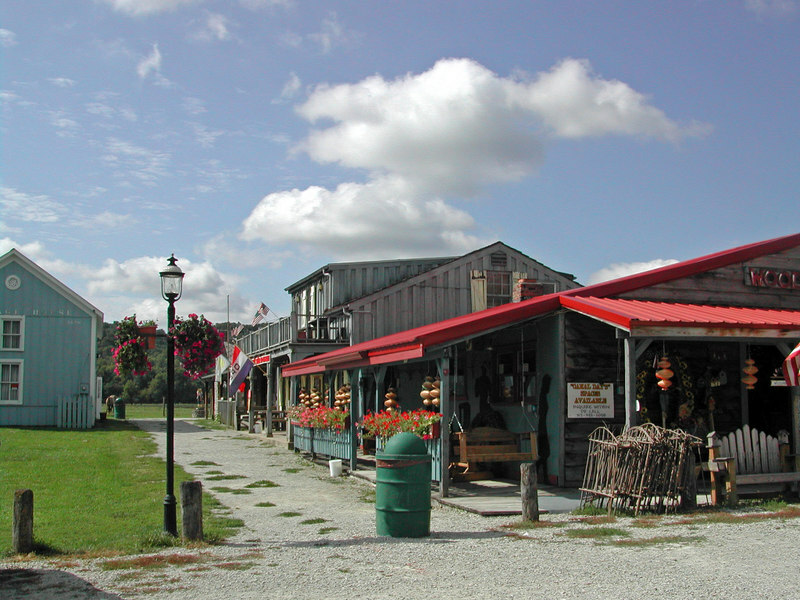 We took in our two favorite flea markets and took a day trip to Metamora, IN, about 1 1/2 hours away. The Candidate must be breathing. The Candidate must not have more than four legs. The website states: "This Mayor campaign will be ran just like any other democratic election process: You buy your way in!" This is a creative fund raiser to help build a state-of-the-art interpretive center to promote and preserve the canal era history. Here are some of the candidate posters around town. 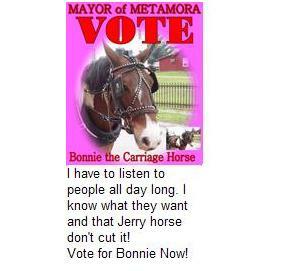 For more information about the Honorary Mayoral race in Metamora, click on this link. 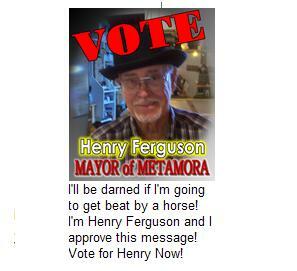 Metamora Mayoral Race They're having a lot of fun with it. Next week, we'll be attending a week-long Escapees Fall Rally at the Van Wert County Fairgrounds here in Ohio, about 2 1/2 hours northwest of here. It's a week full of a variety of seminars, entertainment, and meetin' and greetin' other RVers. We're looking forward to it. Our new lifestyle continues to be surreal in many ways. We still have to catch ourselves thinking we have to pack up to get back home and then realizing we don't. We were able to take advantage of an "early bird special" at a restaurant and having time to read, study, or do whatever is still a treat beyond imagination. We're so grateful for this opportunity.